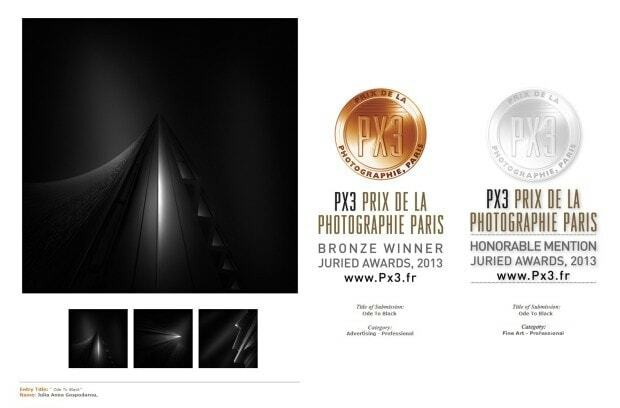 I’m really happy to have won two distinctions in the PROFESSIONAL ARCHITECTURE CATEGORY at the PX3 2013 – Prix de le Photographie de Paris, a Bronze (3rd Prize) for Advertising – Architecture Professionals and an Honorable Mention for Fine Art – Architecture Professionals for my series “Ode to Black“. The level of the winning images was truly outstanding and many of the photographers that won distinctions are among the ones I admire and among my friends too. I will name a few, hoping not to miss too many: Jeff Gaydash, Marc Koegel (who will both be my co-instructors at the Chicago Fine Art Architectural Workshop), Pierre Pallegrini, Hengki Koentjoro, Olivier du Tré, Akira Takaue, Matthias Haltenhof, Thibault Roland, Michael de Guzman, Volker Birke, Francis Gagnon. I’m also very proud of my student Dragos Ioneanu, who has attended the Athens Architectural Workshop and who won the third prize at Fine Art Architecture Non-Professionals Category, with an image from the workshop. This is the text of the press release of the PX3 competition, speaking about the awards. JULIA ANNA GOSPODAROU OF GREECE WAS AWARDED THIRD PRIZE IN THE PX3 2013 COMPETITION. Julia Anna Gospodarou of Greece was Awarded: Third Prize in category Advertising for the entry entitled, ” Ode To Black .” The jury selected PX3 2013’s winners from thousands of photography entries from over 85 countries. Julia Anna Gospodarou of Greece was Awarded: Honorable Mention in category Fine Art for the entry entitled, ” Ode To Black .” The jury selected PX3 2013’s winners from thousands of photography entries from over 85 countries. Raynaldy, Director of Purpose, Paris; Viviene Esders, Expert près la Cour d’Appel de Paris; Mark Heflin, Director of American Illustration + American Photography, New York; Sara Rumens, Lifestyle Photo Editor of Grazia Magazine, London; Françoise Paviot, Director of Galerie Françoise Paviot, Paris; Chrisitine Ollier, Art Director of Filles du Calvaire, Paris; Natalie Johnson, Features Editor of Digital Photographer Magazine, London; Natalie Belayche, Director of Visual Delight, Paris; Kenan Aktulun, VP/Creative Director of Digitas, New York; Chiara Mariani, Photo Editor of Corriere della Sera Magazine, Italy; Arnaud Adida, Director of Acte 2 Gallery/Agency, Paris; Jeannette Mariani, Director of 13 Sévigné Gallery, Paris; Bernard Utudjian, Director of Galerie Polaris, Paris; Agnès Voltz, Director of Chambre Avec Vues, Paris; and Alice Gabriner, World Picture Editor of Time Magazine, New York.